Successful transfer and sharing of knowledge rely mainly on social attitudes, behaviours and networks, rather than ICT-based networks. The availability of Information and Communication Technologies (ICTs) facilitates the management of projects in general. ICTs are central to both managing Information Literacy projects and providing access to learning resources and opportunities for collaborative learning. In this paper, we propose a framework for quality management of information literacy projects. Learning from the field of Information Systems Quality Management the proposed framework encompasses Deming's PDCA (Plan, Do, Check, Act) Cycle and Kitchenham's Process Improvement model. From the Information Literacy field the SCONUL model provide the dimension of standardisation. The framework is customisable to prioritise aspects based on the likelihood, proximity and impact of risks. The success of Information Literacy programmes and projects depends on the availability and use of ICTs and in this paper we argue how the Information Literacy Project success can be enhanced by using our framework. Information Literacy is recognised as the most important literacy of the 21st century. Information Literacy encapsulates knowing when and why information is needed, knowing where and how to find information, and knowing how to evaluate and communicate information in a professional and ethical manner. UNESCO identifies Information Literacy as a fundamental human right that enables individuals in all societies and cultures to achieve their potential: “Information literacy empowers people in all walks of life to seek, evaluate, use and create information effectively to achieve their personal, social, occupational and educational goals. It is a basic human right in a digital world and promotes social inclusion in all nations” (UNESCO, 2015). The Chartered Institute of Library and Information Professionals (CILIP) define Information Literacy (IL) as “knowing when and why you need information, where to find it, and how to evaluate, use and communicate it in an ethical manner” (CILIP, 2014). Bruce explains how information literacy extends the traditional concept of functional literacy, and is inextricable from learning: She emphasises that “Information literacy is a natural extension of the concept of literacy in our information society, and information literacy education is the catalyst required to transform the information society of today into the learning society of tomorrow” (2002). In recent years, our conceptualisation of Information Literacy has evolved from a comparatively linear, skills-based construct, towards an understanding of Information Literacy as a situated social practice, in which the social, cultural, political, economic and historical practices in a country or organisation, which frame the behaviour of the individual, must be considered (Lupton & Bruce, 2010). Newer constructs, such as Metaliteracy, suggest a broader, overarching literacy framework appropriate for the digital age, which provides “the higher order thinking required to engage with multiple document types through various media formats in collaborative environments” (Mackey & Jacobson, 2011). The ubiquity of ICTs in all spheres of private and public life, has also led to the emergence of digital literacy, a construct that overlaps with information literacy, but which focuses more specifically on meaningful engagement with digital media and tools in multiple contexts. 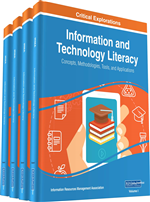 As with information literacy, recent definitions have begun to reflect an emphasis on socially constructed identity and practice, active citizenship and cultural engagement rather than simply enumerate ICT-focused skills and competences. Similarly, the importance of digital literacy and digital competence is reflected in an increasing number of agendas and strategies across Europe, from the European Commission Digital Agenda for Europe, and European DigComp Framework (European Commission, 2013), to country-specific initiatives, including the Digital Inclusion Strategy (UK Government, 2014) in the UK, the National Digital Strategy (Dept. of Comm’s, 2013) in the Irish Republic, and the Strategy for Digital Growth (Agenzia per l’Italia Digitale, 2015) in Italy, amongst others. There is broad agreement, at least in principle, that Information Literacy needs to be introduced across primary, secondary and tertiary education. However, to date, despite the increasing number of Information Literacy initiatives at all levels of education, there have been very few attempts to ensure the quality and the success of Information Literacy projects.